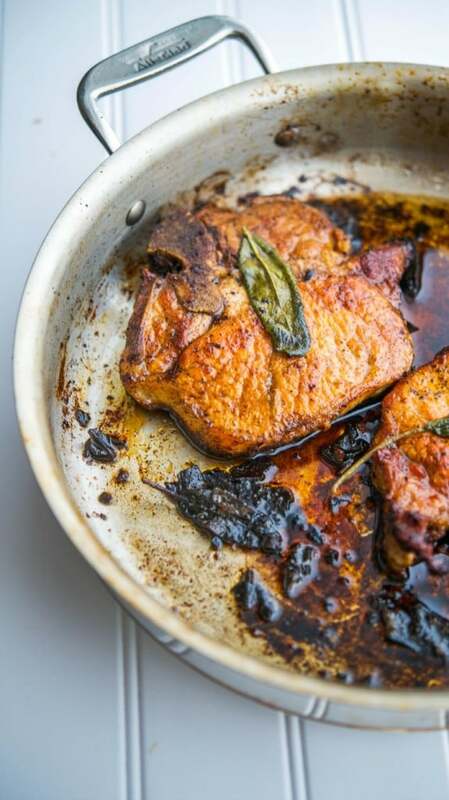 These savory Brown Butter & Sage Pan Seared Pork Chops contain three ingredients and can be ready in 15 minutes for a delicious and easy weeknight meal. 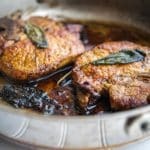 This recipe for Brown Butter & Sage Pan Seared Pork Chops is so easy, I can hardly call it a recipe. All you need are three ingredients: bone-in center cut pork chops, butter and fresh sage. That’s it! Searing is a technique in which the surface of the food is cooked at a high temperature until a caramelized crust forms. 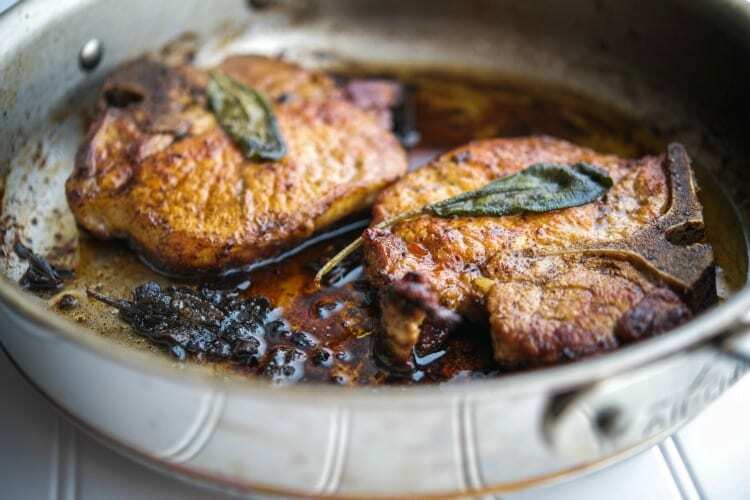 Using this method, along with the nutty flavor of the brown butter and fresh sage; which has an aromatic, musty mint taste, make these pork chops a must-try and perfect to celebrate the Fall flavors. Pan searing also helps seal in the natural juices so these pork chops are super tender and moist; not to mention they only take about 10 minutes in the pan. The key is to use a heavy skillet; either stainless or cast iron to get the best results. See that golden color? 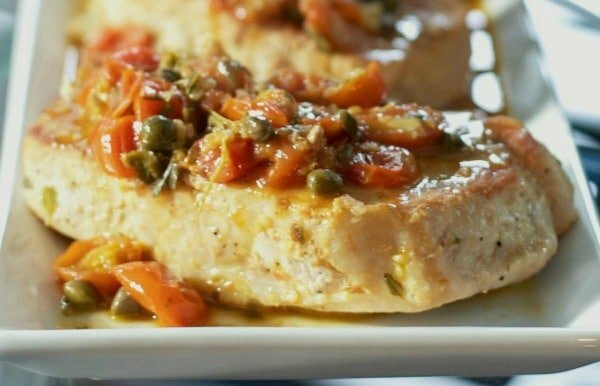 You won’t get that on your pork chops if you use a nonstick pan for this recipe. Remove the pork from the pan and discard any remaining butter. Easy right? 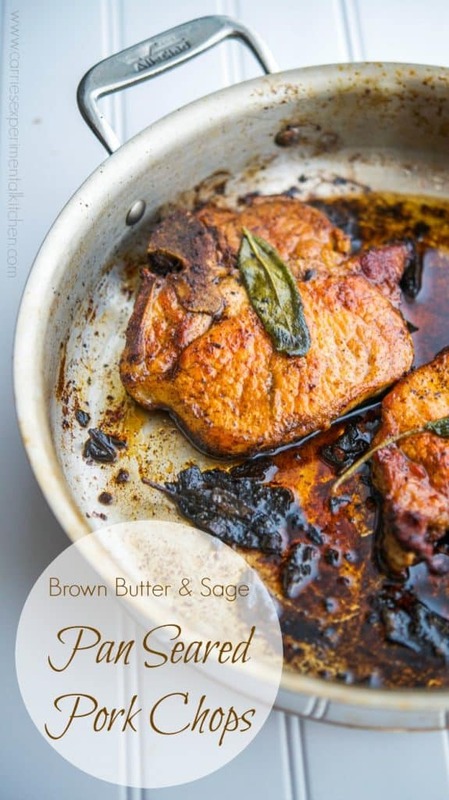 These Brown Butter & Sage Pan Seared Pork Chops were delicious! Not very healthy cooked in butter might I add, but most of the butter is discarded so only about 1 tbsp. actually coats all four of the pork chops so I guess it’s not that bad. Serve with your favorite side dish like this Pumpkin & Sage Risotto and Maple & Sage Glazed Petite Carrots. ~Enjoy! 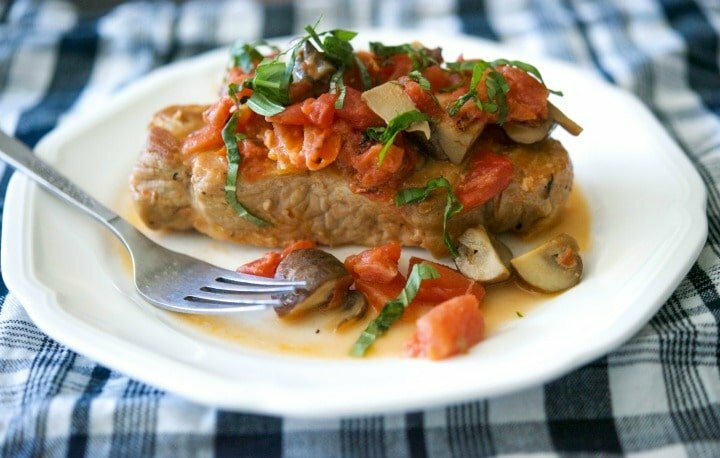 These savory pork chops contain three ingredients and can be ready in 15 minutes for a delicious and easy weeknight meal. Melt butter in a heavy bottomed skillet over medium high heat and add the pork chops. Cook approximately 3-5 minutes per side (depending on the thickness) allowing them to brown; adding the sage leaves after turning the pork chops over. Internal temperature of the pork should be at least 145 degrees F.
Thank you so much for including my recipe Kalyn, have a great month! Thank you Laurie, I think they’re my new favorite way to make them because they’re so quick! 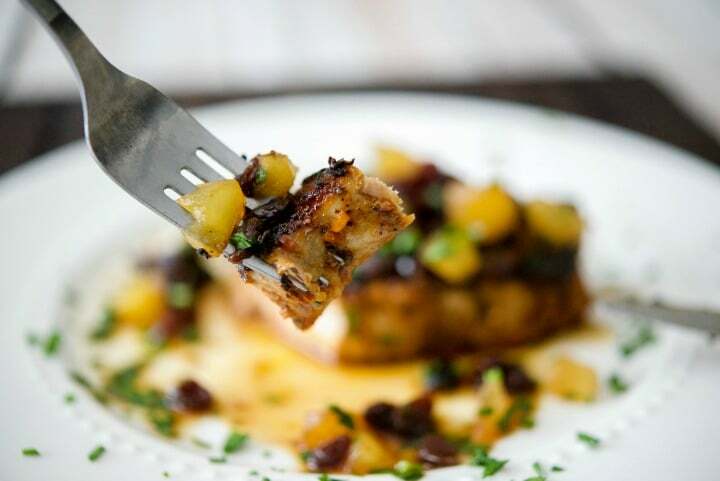 i love pork chops and am always looking for new, easy ways to make them. You can also swap out the sage for other herbs as well. Thanks for stopping by Molli. So many delicious recipes on your blog! This sounds delicious and thank you for sharing with us.